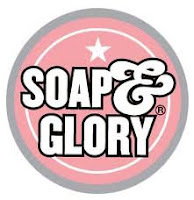 For a long time now I've had my eye on a new range of products by the company Soap & Glory. All the products have fab names, and are packaged in kitschy pink 50's style packaging. The 2 that I bought are : The Righteous Butter Body Lotion and Flake Away Body Polish. The Righteous Butter comes in a 300ml round tub with a screw top lid, or is also available in a travel size of 50ml. I love the packaging of this product - baby pink, with grey and white retro lettering and pictures of pin-up girls, giving a fun feel before you've even got the lid off. If you like the retro style Benefit products then these will be right up your street. This smells gorgeous, a lovely clean and fresh smell but with a hint of underlying muskiness. The cream itself is white and the consistency is what you would expect from a body butter - thick, but feels far more silky to the touch than the Body Shop Body Butters. You only need to apply a little as it goes a very long way and it's absorbed so easily into the skin that it almost seems to melt in - the packaging claims that this will be like wearing velvet on your skin and I would agree - my skin felt really smooth and silky to touch. The cream is packed with Shea Butter and Aloe Vera so is both moisturizing and soothing. This amazing body butter as featured on the hit TV series 'How to look good naked', does exactly what is says on the tin; " A body moisturizing formula so virtuous you might swear you were wearing velvet". I can honestly say my skin has never felt smoother. 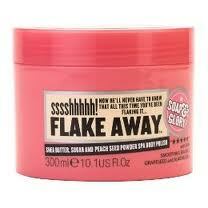 This scrub is fantastic on dry skin and as soon as you dry off you feel so moisturised and clean. Now if you genuinely have dry skin this is the answer to waving bye bye to it. It leaves skin soft, clean and thoroughly moisturised to the touch. If you have very very dry skin this and the 'Self 'Righteous Body Butter' is brilliant applied afterwards. DO NOT USE IT ON THE FACE....its only meant for your body. Check out boots for special offers, they often do 2 for the price of 3. It is definitely worth looking out for the offers. Beauty Bargain of the Week!! What do your spots mean...?? ?